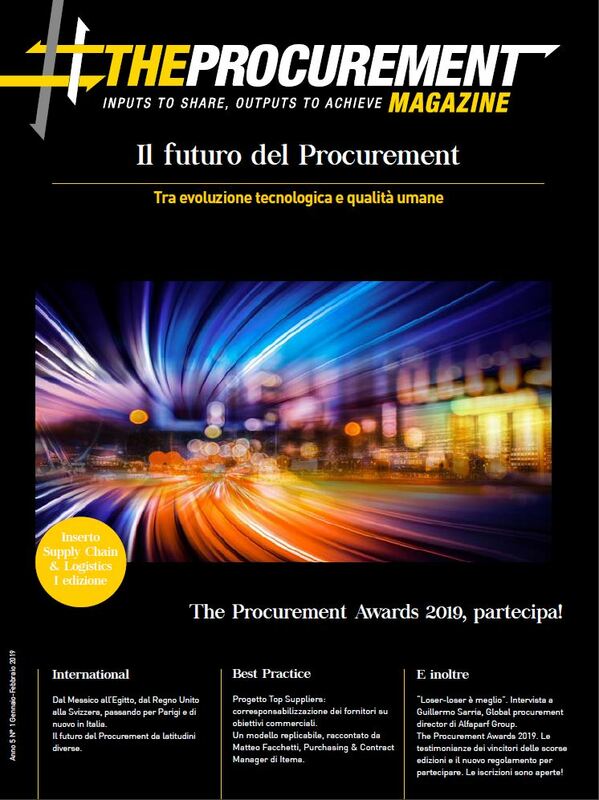 Riportiamo l’articolo l’articolo di Lari Nummien, Head of Marketing & Communication di Sievo, pubblicata sul magazine “Digital Supply Chain & e-Procurement” (Anno 4 Numero 3). 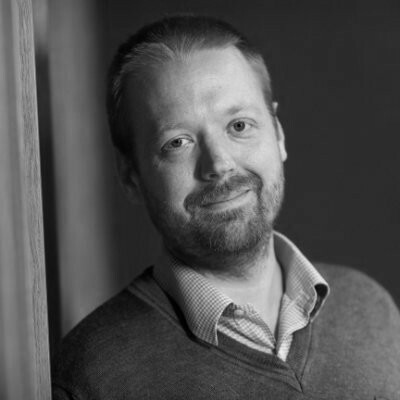 When I started my new role as the Head of Marketing and Communications for Sievo last year, I discovered that this 14 year old Finnish technology company had a wealth of experience offering relationship counselling to senior executives on top of building world-class procurement analytics software. 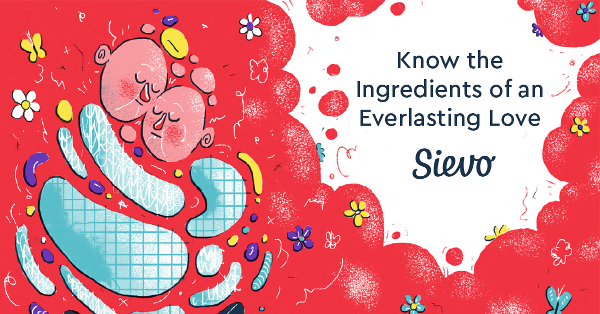 Recognizing the importance of relationships, I assembled a large team of experts to write a book, bringing in ideas from everyone from our CEO, CFO, customers and product managers. And so, a few months later, Procurement Loves Finance was born. In essence, this book is about bridging the gap between Procurement and Finance, so that both key roles achieve better results, together. The book launch has brought me to many international destinations over the past two months. I’ve participated in events from the Supply Chain Finance Conference in Milan to the largest Procurement events of the year in the United States and United Kingdom. I’ve shared hundreds of printed copies of the book and received a lot of enthusiastic feedback on this key topic. The one unifying trend talking with international procurement executives is that the relationship between Procurement and Finance remains complicated. Why so? Many Procurement executives feel today that Finance does not understand their contribution to business. There are often differences in the measurement of goals and even the language that is used in the boardroom. One may talk of EBITDA, while the other talks of realized savings over the contract lifecycle. Recognizing differences is the first step in resolving problems in any relationships. The first chapter in our book addresses the challenge and root causes of the different viewpoints between Procurement and Finance. It is not only important to understand differences, it is also important to recognize the value partners brings to a relationships. Finance should recognize Procurement as a valuable partner in a number of ways. The second chapter of our book highlights five superhero traits Procurement brings to business. The Deal-Maker – not just negotiating low prices, but sourcing highest- quality goods or services for the best possible prices. The Defender – protecting business from a variety of external threats, from price variance to supplier risk and even currency fluctuations. The Innovator – bringing innovation to business by connecting internal talent and with valuable external partners. The Partner – bringing more business value to the bottom line through driving collaborative procurement strategies. The Visionary – predicting how procurement costs changes impact and influence future profitability. Once both partners understand sources of conflict and the value each other brings to the table it’s time to find common ground. The third chapter of Procurement Loves Finance is all about proving Procurement’s contribution to financial performance. A common ground is reached when Procurement shifts focus from category savings to the way Finance is used to measuring external spend (CAPEX vs. OPEX, One-off vs. recurring costs). To further align procurement performance with Finance, the book details a number of concrete examples and calculations to isolate procurement contribution from non-controllable factors. How, for example, Procurement can isolate savings made during the financial year from the volume or currency changes that are often outside of Procurement’s control. At the heart of the book is a methodology refined by the books authors’ over the past 14 years. 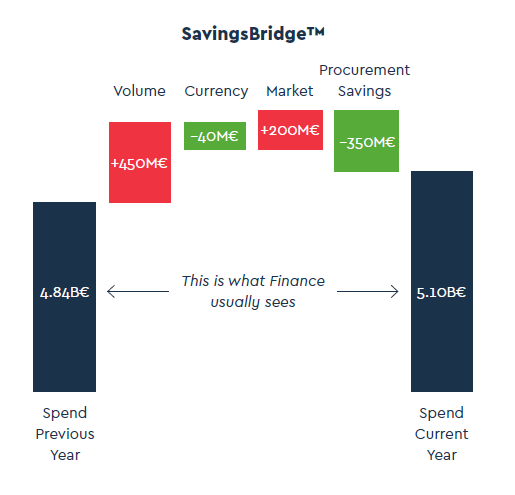 On the surface of it, SavingsBridge™ is a waterfall chart like many others. It shows the different value drivers impacting Procurement performance in a specific financial period. On a deeper level, SavingsBridge™ is effective method to aligning Procurement with Finance because of its simplicity. When both sides can agree on a common set of numbers and value drivers, it makes discussions about strategies and achieved results more transparent. How to achieve such a simple end result? That’s a longer story, but also revealed in the book. In any true partnership it is better to focus on what can be done in the future instead of dwelling on what already happened. The fourth chapter of Procurement Loves Finance provides some insights on how Procurement and Finance can look forward together. The book outlines a number of approaches and advantages for collaborative forecasting, where coversations between Procurement and Finance is shifted from realized savings to predicting future spend. Once again, the it’s not just theory, the fourth chapter of the book also contains practical examples and calculations. The route to any CFO’s heart is not in explaining what happened before, but providing insights into what impacts the bottom line in the future. Procurement Loves Finance shows how Procurement can be at the heart of any businesses’ opportunity to drive profitability. Drawing to the natural conclusion, the final chapter of the book discussed how Procurement and Finance can maintain a successful, loving partnership. Trust – the belief your partner always has your best interest at heart. Focus – dedicating energy in the relationship on what matters the most. 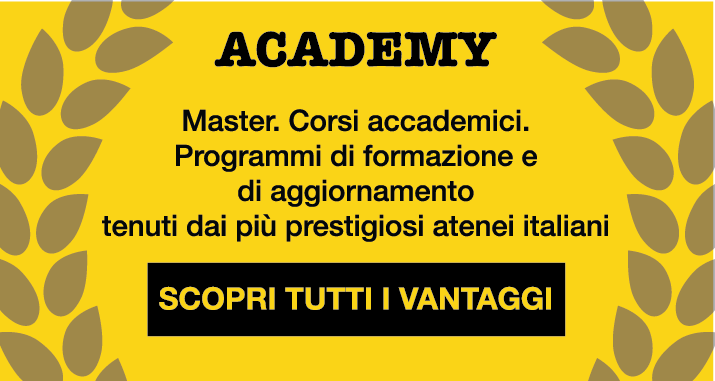 Can you learn to love Finance? Too often today businesses are run on numbers alone. Targets, goals and metrics are important, but so too are relationships between people. Some in procurement consider their relationship with Finance unrepairable, but many more see the value of being proactive in building a true partnership. 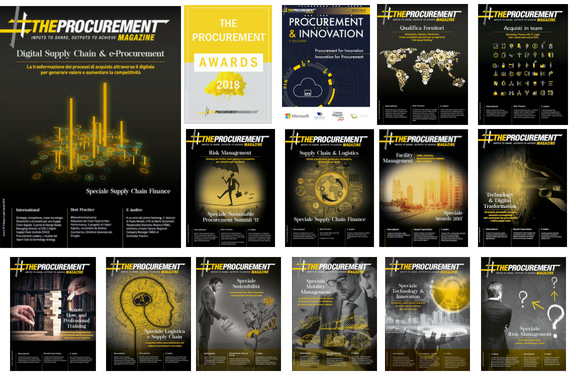 Since the launch of Procurement Loves Finance I’ve spoken to hundreds of experienced Procurement executives with very diverse views of colleagues Finance. If you think there is room for optimism, then this is the book for you! Loves Finance was written by Sievo, the procurement analytics software specialists. Readers of the Procurement can request a complimentary printed copy of the book by submitting their address details on Sievo’s website. Link here: Procurement Loves Finance.